However, most of them have not tried doing this one thing that would surely put an end to their bickering. A thing so simple, powerful and effective, that it is almost guaranteed to work. That simple solution (and the necessary first-step) for ending our damaging arguing cycle is: surrendering. That’s right. Quitting. Being the first to drop out of an argument. Does it sound silly? Too simple? That is exactly why most people rule it out! But, to find the solution, you must understand the problem. And, this is a problem that is frequently misdiagnosed. For example, you may think your husband is the problem. You see him coming your way, wearing that no-good look on his face. Something inside of you freezes, and you think, “Oh great… here comes trouble. So much for having a peaceful afternoon” But, despite what you think, he is not the problem. To be honest, the problem is, well… you. Your fears. Your negative expectations. Your insistent idea that you are a victim, unable to change things. As long as you think the problem lies in him (or in somebody else), you will not realize all that YOU can do to fix it. Now, you’ve been saying for such a long time that you don’t like arguing. You say you absolutely HATE IT when your precious time is wasted. Is that true? Great! It’s time to prove it! If you care about peace as much as you say you do, then put your care into action and start surrendering. When he starts giving you his opinionated views about politics, and you find you’ve somehow engaged in a pointless argument with him, you have an option. Rather than continue going down that silly trail you BOTH are on, simply surrender. STOP ARGUING WITH YOUR SPOUSE! Agree to disagree. You can do it silently. Or, aloud. Let him win. That’s right… give him the satisfaction he wants. Let him feel like you’ve heard him and that he has valid feelings. Bear in mind, this does not mean that you are surrendering your point of view. It doesn’t mean you’ve stopped caring. It doesn’t mean that you’re giving up on justice or that you have stopped standing up for truth. It just means that you are choosing not to participate in a pointless, ineffective battle for dominance, and that you’d rather settle things in a more peaceful, sensible way, and at a better, more logical time. If you’re a self-aware person (and one who is honest), you’ll admit that there is usually a strong desire to stay in an argument and win it, thinking that you are motivated by some nobler, grander desire than simply to win. Of course, that’s usually false, and usually proven by how hard it is not to return jabs for jabs and retorts for retorts. It can feel crushing to leave an argument that you feel passionate about. It can feel like you’re losing more than a small match… like you’re losing a part of yourself. But, you usually have a lot more to lose by staying in an argument than you do by exiting one. Since most of us can agree that arguing is by and large an unproductive, disadvantageous thing, and that it’s usually not the birthplace of great decisions, then let’s also agree that we should learn to surrender when we feel like staying in. Now, let’s talk a little more about how exactly that is done. STOP ARGUING WITH YOUR SPOUSE – I hope you enjoyed this section from STOP ARGUING. 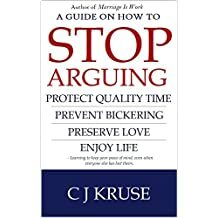 If you’d like to stop arguing with your spouse, or your kids, your coworkers, your in-laws, or your pets, then I think you will enjoy this book.